This past Memorial Day, I ran the Brian Kraft Memorial 5k. It is a flat and fast race around Lake Nokomis. When I say FAST, I mean it! The winning time was 14:20! It attracts a very competitive field. I ran this race last year, but it was right after the Flying Pig Marathon, so I was still in recovery mode. This year, I was ready to race! I participated in this race as part of my running club‘s racing team, which is part of the USATF racing circuit. 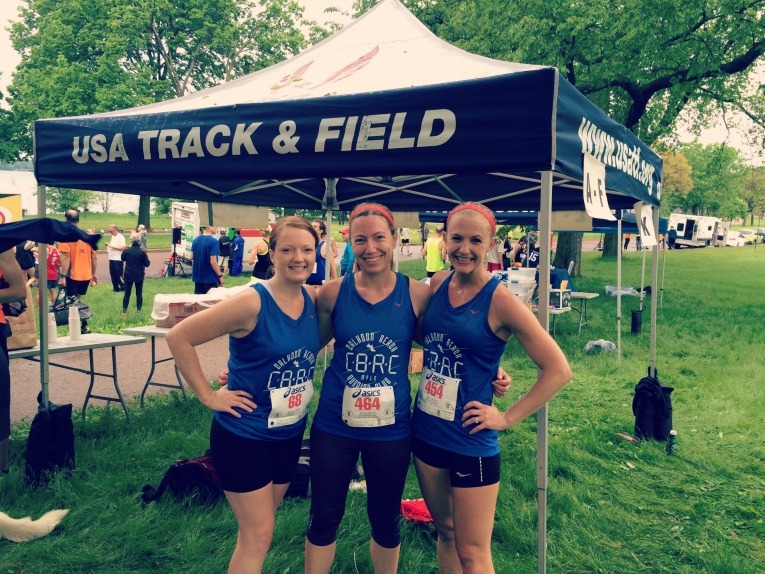 We compete against other running clubs in the cities in a series of races of various distances throughout the summer. 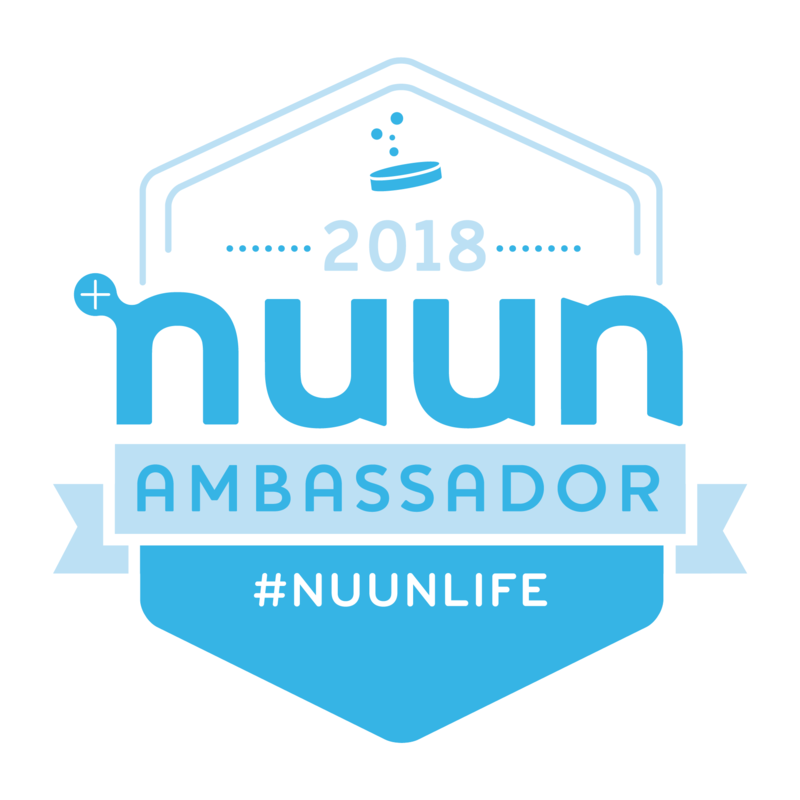 Your team’s “score” is based on your fastest 5 women and 5 men, so usually my times don’t actually count, but I still love being part of the team! First a little background…Who is Brian Kraft? So, its great to hear that this race is for a good cause! It’s also just a cool, laid-back race that I definitely enjoy. The race starts at 8:30 sharp. We arrived around 7:30 and did a few miles to warmup as well as some strides. The skies were overcast and it was drizzling a bit, but it wasn’t too bad for a race. Humid of course, but not too terrible. The course is simple- just one fast lap around Lake Nokomis! There was one water stop, though I didn’t use it. There was plenty of water at the finish, as well as some other goodies. And the race tees are the best! They are soft cotton retro style tees. I will definitely be wearing mine around quite a bit! You might notice below that somehow I am registered as a 53-year old! I have no idea how that happened. Even in the 50+ age group, there were still 6 women in front of me. The top woman in the 50+ age group ran a 19:08 or a 6:10 min/mile. Amazing! That’s how ridiculously fast this race is! Dustin set a 5k PR too, running an 18:01 or 5:48 min/miles- yay Dustin! Of course, now he wants to cut off that one second and get under 18 minutes…which I’m sure he can do. Like I said, racing keeps you coming back for more! It was a great morning for a race. Afterwards, I did about 3 miles to cool-down and then one of our run club members who lives nearby hosted a brunch. I made a raspberry/chocolate chip/banana bread from Jenna’s blog (recipe here) that was very tasty. 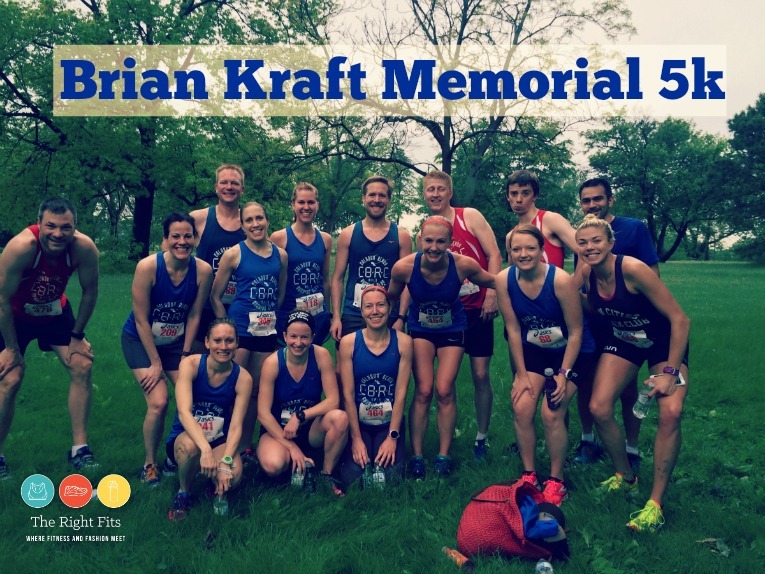 The Brian Kraft Memorial 5k race is definitely a “runner’s” race- nothing fancy, not a lot of bells and whistles, just a lot of serious runners. 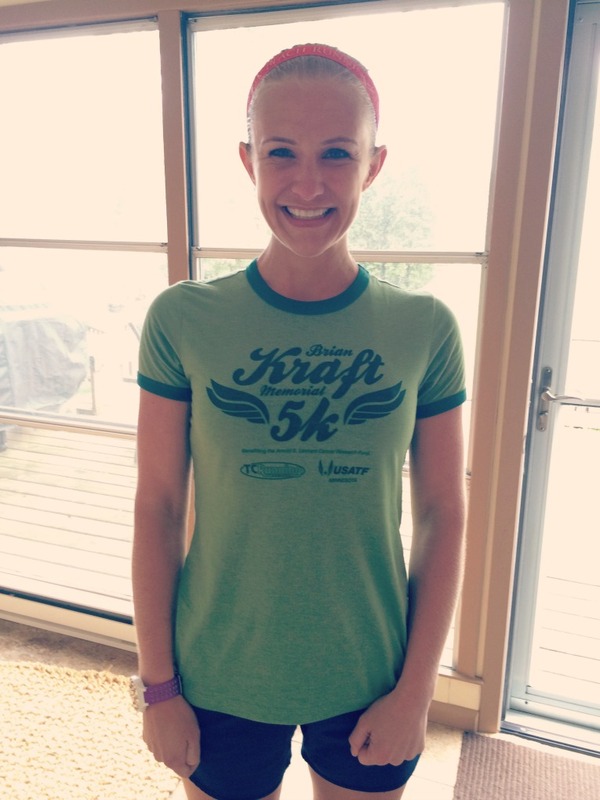 I love this 5k and highly recommend it! And…don’t you love our new team singlets? I love the blue much more than red and the fit is great. You’ll be seeing this top a lot at all of our USATF races this summer! 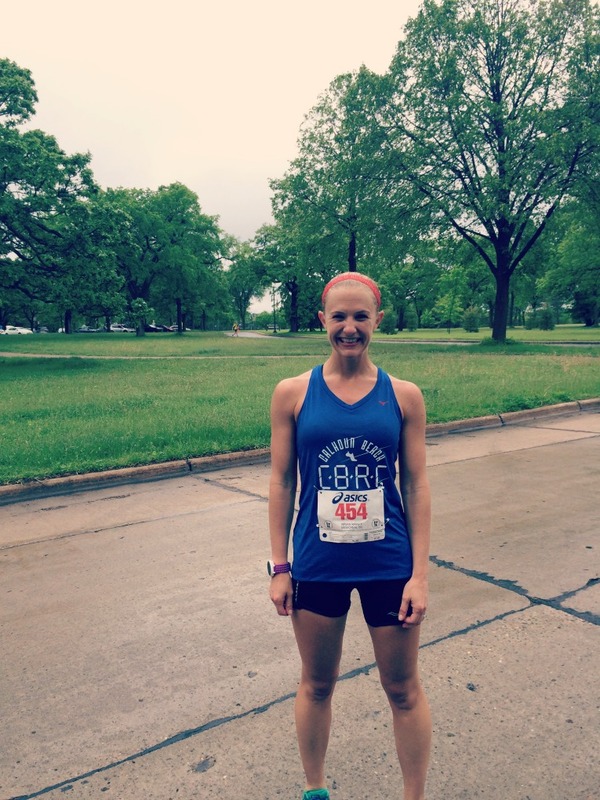 « Weekly Recap: Four Weeks Until Grandma’s Marathon! 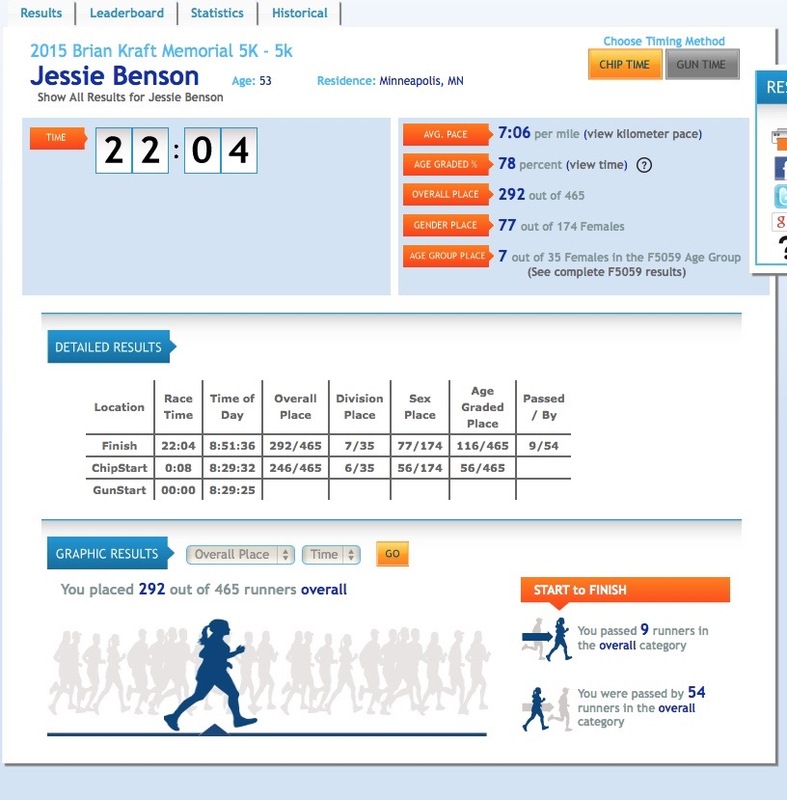 Great job on the 5K, Jessie! You and all the other CBRC’ers always amaze me. Also, I’m glad you liked the banana bread! Thanks Jenna! I made two loaves…one to bring to brunch and one that Dustin and I have been enjoying 🙂 It’s scrumptious! Congrats on the PR!!! You are so awesome! Your hard work is definitely paying off! THANK YOU Katie 🙂 I love your positivity. Oh my gosh, it can intimidate anyone! I swear, next year, I am just having a cup of coffee and watches from the sidelines..It would be fun just to admire all those speedy people! Love the singlets – and the visual connection with the running club is so cool as well. A fun motivation to get out there and race. Ahh, you’re right! I was originally looking at my gun time…argh! Only 5 seconds & I could have been 21:59!!! Super speedy! Congrats! And, what a great race for a great cause. Love the retro t-shirt, too!